Turnips are an ancient vegetable that was cultivated almost 4,000 years ago. Both the Greeks and Romans thought highly of the turnip and developed several new varieties. Its widespread popularity in Europe has continued, although since the discovery of the potato, it is less widely cultivated than it once was. Turnips were introduced into North America by the early European settlers and colonists. They grew well in the South and became a popular food in the local cuisine of this region. They are a member of the cabbage family. 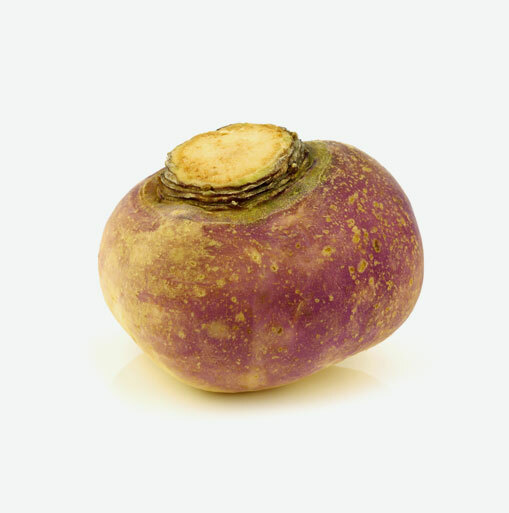 Rutabaga is also called the Swede or Swedish turnip. The name comes from the Swedish word “rotbagga” meaning round vegetable. Did you know that this interesting veggie is also popular in Scotland where it is a regular accompaniment to Haggis. Rutabaga is relatively low in calories which makes it a good selection for weight watchers. It is also a good source of Vitamin C which helps to enhance the immune system and keep healthy gums. Vitamin C is a powerful antioxidant and helps to kill free radicals which damage our cells. When selecting rutabagas, look for a shiny, fairly smooth surface and bright purple colour. Avoid those that are woody, dull or faded looking. Keep rutabaga in a cool, dry place, or in the refrigerator. Waxed rutabaga will keep for up to a month. To prepare rutabaga, slice off the top end and cut into pieces. Peel off the skin and wax covering. Rinse well under cold water and then cook as directed by your recipe. Pared and cut into pieces, rutabaga can be cooked with a roast of beef, veal, or lamb. It can be combined with other vegetables as a steamed side dish. This versatile veggie can be mashed and served with a bit of butter or a drizzle of olive oil, salt and pepper, a dash of ground cinnamon or nutmeg. Cut into small pieces, rutabaga adds flavour to mixed vegetable soups. Thinly sliced and battered, it’s a tasty addition to mixed vegetable tempura.